Authored by chad on Jan 24 2017, 12:41 AM. 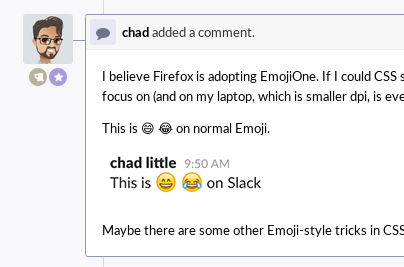 Ref T12139, installs 'Segoe UI Emoji' as a standard font call for color emoji on Windows devices. Review Emoji on Win 10 Chrome / Edge, Mac Chrome / Safari. Not sure if this was an intentional side effect or not, not a big deal either way. I can grab screenshots of before/after. Please share! I tested on Windows, but I don't spend a significant amount of time there. Also (not my capture) but even now this is roughly how emoji looks for me on Windows 7. Maybe it looks better under windows 10, I don't have Segoe UI Emoji as a font though... so I fall back to the less pretty glyphs. Not really a big deal, just a note. I'm happy to report back how it looks tonight from a Win10 system.